In a hot pan, add olive oil and Brussels sprouts, cook until crispy. Season with salt and pepper. Place in oven at 380 degrees F for approximately 10minutes or until tender. Remove from oven and deglaze with vinegar, add pine nuts and parmesan cheese. Before serving garnish with fresh pomegranate seeds. In a pot with boiling water, cook macaroni until soft. In a sauce pan melt cheeses with heavy cream, and diced truffle peelings. Cook until creamy and all the cheese is melted. Season with salt and pepper. Add macaroni to cheese mixture, and mix well. Place macaroni in a baking casserole and cook in oven at 380F for approximately 20 minutes, or a crust forms on top. Remove from oven and sprinkle breadcrumbs. Drizzle with white truffle oil and garnish with fresh diced chives. Separate and clean the mushrooms and set aside. In a pot with boiling water, quickly blanch mushrooms for 30 seconds or until soft, and chill. In a separate pan add olive oil and diced garlic and cook in very low heat, until garlic is crispy and golden, carefully to not burn. Set aside garlic. In a hot sauté pan add olive oil and sauté mushrooms until crispy. Add porcini powder, season with salt and pepper. Add crispy garlic and fresh chopped parsley and serve immediately. Season Prime Rib with salt and pepper and place in roasting pan. Rub meat with the herb compound butter and refrigerate for 12 hours before roasting. Dice carrots, celery and onion in small pieces and cut shallots in half. Place vegetables in bottom of roasting pan, cover with fresh herbs. 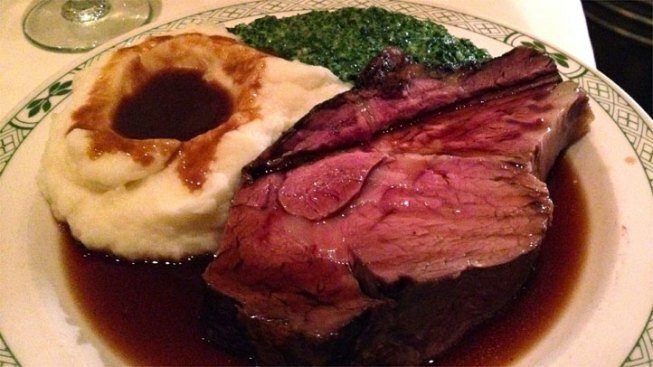 When prime rib is cooked, remove from oven and let rest for approximately 5 minutes before serving. Using electric mixer beat egg whites and salt in very large bowl until foamy. With mixer running, gradually beat in 1/4 cup sugar, beating just until stiff peaks form. Using electric mixer, beat yolks with 1/3 cup sugar and bourbon in large bowl until thickened, about 5 minutes. Add yolk mixture to egg-white mixture. Add butter; fold gently just to blend. Pour into prepared baking sheet, spreading batter gently to form even layer. Bake cake until center is firm to touch, about 14 minutes. Cool in pan on rack. Stir 1 1/4 cups sugar and 1/3 cup water in heavy medium saucepan over medium heat until sugar dissolves. Increase heat; boil without stirring until deep amber, occasionally swirling pan and brushing down sides with wet pastry brush, about 9 minutes (time will vary, depending on size of pan). Remove from heat; immediately add cream (mixture will bubble vigorously). Whisk in butter, bourbon, and salt. Stir over medium heat until any caramel bits dissolve. Transfer 1 cup caramel sauce to small pitcher. Add chocolate to remaining caramel in saucepan. Let stand off heat 5 minutes; whisk until smooth. Transfer to bowl. Let frosting stand until spreadable, stirring occasionally, about 1 hour. Spread 1 cup frosting over cake in even layer. Beginning at one long side and using parchment as aid, roll up cake jelly-roll style. Starting 1 inch in from each end of cake, cut off 3-inch-long diagonal piece from each end. Arrange cake, seam side down, on platter. Garnish cake with candy canes and leaves and serve.